From the moment I discovered Glen Hansard and The Swell Season, I was in love. The music is just amazing. Glen's voice gives me chills. And when he sings with Marketa Irglova...I just can't explain it. Their music is incredible, and it moves me. Some of you not familiar with these artists may have at least heard the song "Falling Slowly." It has grown in popularity in the last couple of years and it is mesmerizing. There is a purpose to mentioning this song, but first I want to give you an opportunity to hear it for yourself. This song won an Oscar when it was used in the independent film "Once." Excellent movie, but for those sensitive to language, they use the "f word" a lot. The reason this song is so significant to me RIGHT NOW, at this point in time, is that just two days ago, I heard the lyrics in a completely new light. I have always loved the song but never really "felt" it, as a love song. With where Kris and I were at for the first 12 1/2 years of our marriage, this song didn't really speak to our relationship. Or, at least, I didn't THINK it did. When, instead of turning on White Collar, (which we usually watch before bed) my amazing husband surprised me and had The Swell Season movie up on Netflix. It made my night. Especially since that same night I was missing Glen Hansard live here at The Pageant. I was giddy as the movie began, like a little kid at Christmas. I had forgotten that it was in our queue, and so it was a pleasant surprise to end the evening, and it was an expression of love, from my incredible husband. As we watched it, of course the song "Falling Slowly" was mentioned, and sung. As I sat there watching the movie and really hearing the words to this song for the first time, I was amazed at how much the lyrics spoke to our story. Kris and I didn't really know each other. We had grown so distant, so far apart. Kris distracted by his addiction; me distracted by the arms of another man. We didn't know each other anymore, I realized, once the affair was brought into the light. And while I was gone, when Kris really started winning my heart back, I could really relate to this concept of not knowing who this new man was, but wanting to. I knew he was different. I knew he was changed. I knew that God had finally broken the chains of his addiction. And I longed to know this man, this man I didn't know. On the other hand, I felt like the next lyrics actually described my affair. "Words fall through me, and always fool me, and I can't react. And games that never amount to more than their meant will play themselves out." Words were always what kept me bound to this affair. Words that encouraged me and made me feel good about myself. They always fooled me. The affair was just a game. And affairs will never amount to more than that--to anything more than an affair. No matter where they lead, even if you end up marrying someone you've committed adultery with, the majority of the time, it will "play itself out." And there will be hurt and pain and brokenness, all over again. 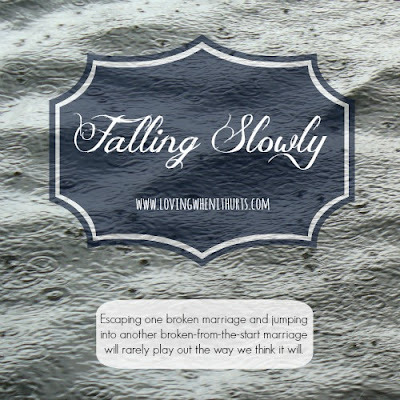 Escaping one broken marriage and jumping into another broken-from-the-start marriage will rarely play out the way we think it will, or want it to. You know the saying..."the grass is always greener..." But anyone who has been through something similar to what Kris and I have, and have chosen to stay and fight, know that the grass might LOOK greener. But it's not. It's dark and dry and dead. I have seen this truth in the lives of my family and friends who have been caught up in something that is so prevalent in our society today. Maybe it'll last a few months. Maybe a decade. But something that starts as an affair will almost always "play itself out." And then there is the chorus. Such sweet, amazing lyrics. How very appropriate with the choice I made to come home. To take a risk, fearful and unsure if we could even navigate through the storm. I leapt forward and stepped onto the sinking ship that was my marriage. We could raise up hope in our marriage. We were finally home. We were finally singing the same song. We were together, creating this beautiful new marriage, this new melody. We fool around for too long. We waste too much time bound by the chains of addiction and sin. And in the end, when it comes to the light (and it WILL come to the light whether you want it to or not), this is the path that most broken couples choose to take. But we made a different choice, because we serve a loving and mighty God, who was not about to let us become a statistic. I am so thankful to God for rescuing us!